Combine the flours, sugar, salt and baking powder together in a semi large bowl. Pour oil into a 1 cup measuring cup; add the egg and then just enough milk to fill the cup. 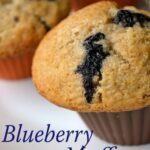 Combine with the flour mixture and add the applesauce and carefully fold in the blueberries.